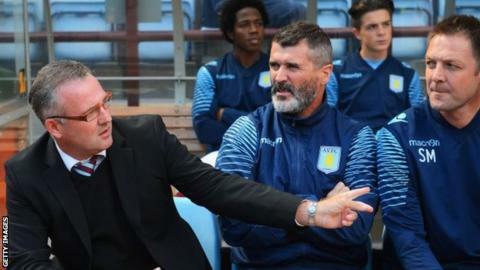 Aston Villa midfielder Tom Cleverley's doorstep conversation with ex-assistant manager Roy Keane was civilised, according to boss Paul Lambert. Republic of Ireland assistant Keane was reported to have been angry at supposed leaks from the dressing room after he quit in November. Keane was reported to have rung the doorbell at Cleverley's home for 15 minutes to confront the player. "It certainly wasn't how it was portrayed," said Lambert. "I spoke to Tom and he assures me that is certainly not what happened. That was it, really. I spoke to Tom and the matter is finished." "All this stems from Roy Keane getting fed up with various rumours that he stormed out of Aston Villa after allegedly rowing with some senior players. Keane wanted to know who was briefing some reporters and went round to ask Tom Cleverley, whom he knows from his Old Trafford days, if he was the source. Paul Lambert, weary and fed up of all the Keane rumours, said Cleverley told him there was no row at his house and a civilised and mature conversation. The Villa manager reiterated there was never a training ground bust-up." Keane, 43, said he stepped down in order to focus on his role in Martin O'Neill's Republic of Ireland coaching team. It has been claimed that Keane had a poor relationship with several senior players, most notably vice-captain Gabriel Agbonlahor. But Lambert said: "Roy's obviously got his Ireland role to contend with and work on, trying to qualify for Euro 2016. There's no problem on that side. He's my pal." England international Cleverley, 25, is on a season-long deal at Villa from Manchester United and is ineligible to face his parent club in their Premier League game at Villa Park on Saturday.